Sometimes you truly have to believe that every idea counts, no matter how small it is. In “The Hudsucker Proxy” (1994) mailroom clerk Norville Barnes hopes to one day strike it rich by exploiting his one brilliant invention. When Barnes’ boss Waring Hudsucker takes a suicidal dive into the streets of New York City, the old man’s stock shares are to be sold to the public. Sidney J. Mussburger of the board of directors however plans to temporarily depress the stock price of Hudsucker Industries and buy the shares himself. To accomplish this, he only needs to replace Hudsucker with a truly incompetent president… Norville. Both the visual and narrative motifs in the film corcern the shape of a circle. 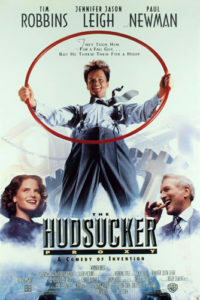 The great Hudsucker Clock, the idea of Karma, Mussburger’s watch and several other elements in the movie remind us of the circular patterns of life. Barnes is set up to be the company president who will destroy Hudsucker Industries, but things turn out a little bit different than expected… Because whoever would have thought that drawing a circle on a piece of paper could be the start of an invention that is loved and cherished all around the world?